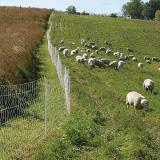 Use PermaNet for sites that have installation problems for permanent wire fences (hills, rocks, curves, trees, no machine access). 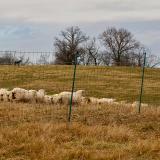 It keeps sheep and goats in and predators out. Can stop a wide range of animals. Designed to be left in one place for months or years. For this it has stronger, heavier, larger PVC posts with longer, thicker, steel spikes, supporting the net better through wind, rain, ice and snow. It's taller, 48"—therefore more reliable. It's a very good conductor (low electrical resistance). This is critical as weed contact may become heavy. Supplied in many lengths—to enable users to buy the right length for each situation. 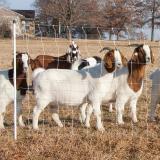 Effective at keeping in sheep, goats, guard dogs and cattle while keeping out deer, coyotes and bear. 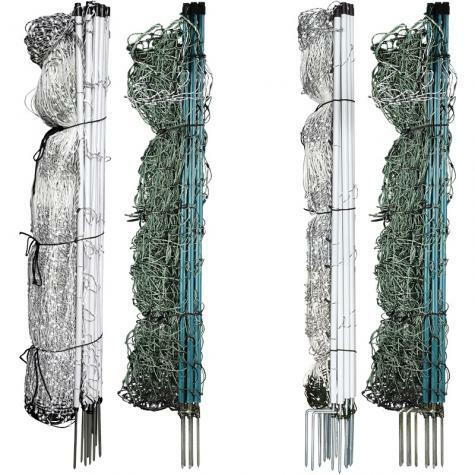 Vertical Strands Plastic strings, spaced every 6"
Horizontal Spacings 6", 4", 4", 4", 4", 4", 8", 8", 6"
Number of reviews: 66 customers reviewed this product. Recommended: 66 out of 66 said they would recommend this product to a friend. When we install a net that needs to stay up for a year (in some cases even longer) we use PermaNet. 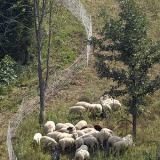 We developed it as a semi-permanent fence to use on our East Farm. The fences were non-existent but we needed the pasture immediately. We put together PermaNet and were so satisfied we decided to offer it. It is heavier and bulkier than ElectroNet and ElectroStop, but it is designed to be installed and left… Read More » alone. Some of us like that you don’t have to bend over as far to install or remove a post. The downside is the vegetation growth along the net, since it stays unmoved for so long. We spray an herbicide along the net to prevent growth. Lack of growth means less vegetation to drain the voltage from the net. Set up easy in our rocky soil. It would have gone much quicker if I'd have knocked the grass down first. 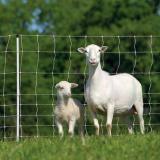 We love our moble fencing! 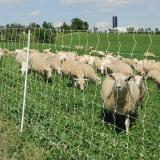 We use it for rotational grazing! We use this stuff 365 days a year. Some rolls are 5 years old and work like the day a got them. We spot graze brush with 6-10 rolls at a time. Don’t even need guardian dogs predators stay out. 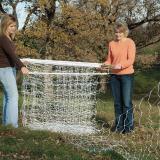 Works very good, recommend watching your animals for the first couple of times in case entanglement. 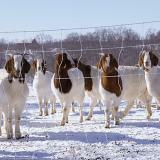 My goat stumbled and fell into the net when shocked. I just installed the PermaNet before a wet snow of six inches. 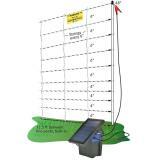 The net was charged at 5200 volts. After the snow, 3600 volts and still standing. Wow.